The awards are run on behalf of the Tourism Authority of Thailand and highlight the great strides that organizations are making to promote sustainable development in the area. The announcement comes after months of nominations from Wanderlusts’ readers and the final decision was made by a panel of sustainable travel experts. 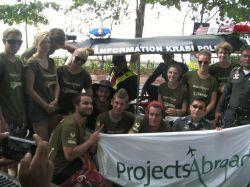 Projects Abroad’s Diving & Marine Conservation project is based along the Andaman Sea coast near Ao Nang. Our volunteers work on research on the coral reefs, beach clean-ups, and tropical reforestation projects. We are also committed to running environmental education and awareness programs with local schools and community groups.